We welcome people sharing our concerns and interests. To contact us: Call Ray Wilkes on 01274 403540 or send us an online message. You can also turn up at one of our free meetings advertised below. WYCA Rail Strategy. James Nutter Head of Rail WYCA. 'Veritas' 43-47 Great George St, Leeds, LS1 3BB. 'Caffe Nero's', 29a Bond Street Leeds LS1 5HD. Next to Tesco. If you want to join us and don't know what we look like, call Mark on 07941 642349. The Yorkshire Branch of Railfuture's next meeting is in Pontefract on Saturday 6 July 2019 from 13:00. We held our annual general meeting on 9 April, where we reviewed our work over what has been a difficult year for transport, but a productive one for us. After serving as Chair for over 30 years, Colin Speakman has decided to retire; it was agreed he should be our first honorary president. Thanks to Colin for all his work and support over the decades. Our new committee is listed above. Peter Yates was also appointed as the 2019/2020 financial examiner. David Walsh of SELRAP, addressed us on SELRAP's campaign to re-open the Skipton to Colne line, closing a gap in our rail network. SELRAP have been campaigning for this for the last 18 years and has over 500 members. They have clearly demonstrated the need for this link by analysing the population centres and their needs; as well as gaining support from those who need to move freight. Recently much progress has been made by SELRAP uniting the Local Authorities involved with the Department for Transport, Network Rail and Transport for the North. Local MPs Andrew Stephenson and John Grogan are also now taking a stand in favour of this. The Secretary of State for Transport, Chris Grayling says further investigation is needed. We hope this investigation is prompt and leads to the re-opening. Diagram reproduced with permission from SELRAP. On 12 February, Geoff McQuillan and Richard Kunz told us the history of the rail lines, now closed and forming their network of walking and cycling routes. 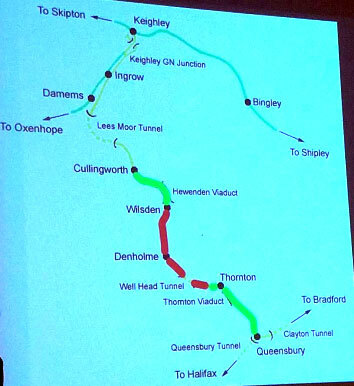 The thick green lines are those routes now open and the thick red line is the challenge ahead along with the reopening of the Queensbury tunnel. The Queensbury line was part of the Great Northern Railway which was constructed from 1864 to 1884, with 15 tunnels, 7 viaducts, many embankments and cuttings and 16 stations. The Queensbury tunnel is 2.5 Km long with 5 shafts and 12 faces, it took 5.5 years to build. The high cost of the construction meant there was no profit to be made. Geoff and Richard explained how they have fought to get funding for the conversion of the old rail lines into walk and cycle ways. “Sustrans” were helpful, as they provide similar facilities elsewhere. But convincing Bradford Council has been more difficult because of the costs involved and their limited vision of what the network can become. Local residents were initially hesitant but are now supportive. Extending the route to Halifax requires tackling the Queensbury Tunnel which is in such a dangerous condition, money is having to be spent on it to make it sufficiently safe to simply inspect it. Highways England, who handle British rail’s residual properties, are wanting to spend money to fill it in; but Bradford Council is now in favour of re-opening the Tunnel. Converting these old lines makes great use of them for the local communities, for both travelling and leisure, improving their air quality. The routes are also being preserved should a railway be required in the future. Members of the Bus Group met with Councillor Groves, the Chair of the Transport Committee at the West Yorkshire Combined Authority, along with Dave Pearson, one of their directors. They highlighted the recent marginal increase in bus passengers in West Yorkshire against a general drop around the UK. There is some concern over the disruption that will be caused by the improvement of key bus corridors, but we were assured that the Combined Authority is now working closely with the Highways department in Leeds. However, this may not be the case for other districts. The new urban traffic control centre in Morley is now an integrated unit as we suggested some time ago. There are further cuts in the pipeline to subsidised services and they explained how they are constrained by the restrictions on the amount of funding they have and how they are allowed to use it. New signage is to appear at the Railway Station in Leeds showing links to buses to colour coded quadrants of the City. Unlike other districts the city centre bus in Leeds is not free and has become part of service 5, this has not proved successful. A new city centre service is to be re-branded and operated by new electric buses. We also raised our concerns about how operators and authorities cope with diversions.